While listening to our audio books this weekend (I might have reviews ready by next weekend), we had plenty of time to get a jump on February crafting. The first project we tackled was to recycle cereal boxes into chair backers, to hold the Valentine's I hope the children will make for each other over the next couple of weeks. First, we cut all except for four inches of the front and sides of the boxes away. ...which we folded over a ruler. Then, we could trim the long part down to make a nice sized flap for the front of the box. ...to cut and glue onto the cardboard. We reverse folded all the folds before we glued the paper on, so the paper went on over what had been the inside of the box, to keep the printing from showing through. I punched two holes on either side of the top of the back of each box with a hole punch. 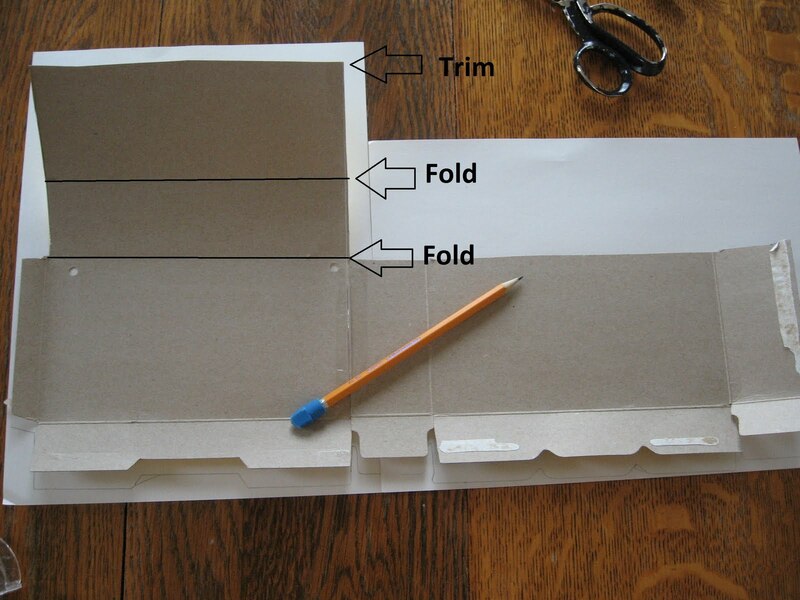 ...or we added stick on Velcro to the front of the box, and the inside of the flap, so it could open and close like a purse. Finally, all that was left was to lace yarn through the holes, for tying the boxes to the backs of the chairs, and adding stickers for decorations. I gave the children label type dot stickers, thinking polka dot boxes would look cute in the dining room. The children had other plans though, and pulled out all of our sticker stash to choose from, as well as crayons and markers - individualizing their boxes. T chose to leave his box undecorated. At 14, he's willing to receive Valentine's from his brother and sisters, especially if they happen to be chocolate, but not to have any part in decorating a frilly-dilly box. Very cute! I love the polka dot box too. How creative! I love little ideas that reuse things we would normally throw away (or bring to the Transfer Station). Do you mind if I pin it for later? Very cute! I have seen mail pouches sewn from cloth, but I have never seen them made from cardboard. So, even us non-sewers could make this one! I was given the Versatile Blogger Award and I would like to pass the Award on to you. There are details on my blog that explain it all. http://shellesplayschool.wordpress.com/ I hope you will play along! So cute and much more frugal than some of the little mailboxes I've seen for sale in the stores. My three year old has started "writing" notes to us so I think I'll put these out to encourage him! Thanks for the great idea! My kids loved it!! Very cute! while I have no kids I'm thinking match the box to my dining room and using it to hide the bills.Thanks for the great idea. Pizza (and a Craft) for Everyone!